Probably fiber optic component has been given greater attention than connectors. Manufacturers have come up with over 80 styles of connectors and about a dozen different ways to install them. There are only two types of splices but numerous ways of implementing them. Fortunately for both manufacturers and installers, only a few types of either are the ones used for most applications. Most fiber optic connectors are plugs or so-called "plug" or "male" connectors with a protruding ferrule that holds the fibers and aligns two fibers for mating. Ferrules are generally made of ceramics which have similar characteristics to the glass fiber and are easily secured with adhesives. These connectors use a mating adapter to mate the two connectors that fits the securing mechanism of the connectors (bayonet, screw-on or snap-in.) The ferrule design is also useful as it can be used to connect directly to active devices like LEDs, VCSELs and detectors. There are also many designs of multi-fiber connectors composite ferrules holding a line of fibers and ruggedized military connectors with multiple ferrules similar to the connector shown above. Some of these connectors use contacting ferrules but some use expanded-beam optical contacts that do not require physical contact and are less sensitive to dirt and contamination. Different connectors and termination procedures are used for singlemode and multimode connectors. Multimode fibers are relatively easy to terminate, so field termination is generally done by installing connectors directly on tight buffered fibers using the procedures outlined below. Most field singlemode terminations are made by splicing a factory-made pigtail or splice-on connector (SOC) onto the installed cable rather than terminating the fiber directly as is commonly done with multimode fiber. Singlemode terminations require extreme care in assembly, especially polishing, to get good performance (low loss and reflectance), so they are usually done in a clean manufacturing facility using heat-cured epoxy and machine polishing. Choosing a connector type for any installation should consider if the connector is compatible with the systems planned to utilize the fiber optic cable plant, if the termination process is familiar to the installer and if the connector is acceptable to the customer. If the systems are not yet specified, hybrid patchcords with different connectors on each end may be necessary. If the installer is not familiar with connector installation, training may be necessary. And sometimes, the user may have been sold on a connector type that is not ideal for the installation, so the installer should discuss the merits of other types before committing to the project. Splices are considered permanent joints. Fusion splicing is most widely used as it provides for the lowest loss and least reflectance, as well as providing the most reliable joint. Virtually all singlemode splices are fusion. Mechanical splicing is used for temporary restoration and for most multimode splicing. Read more on splicing below. The primary specification for connectors or splices is loss or the amount of light lost in the connection. When we say connector loss, we really mean "connection" loss - the loss of a mated pair of connectors, expressed in "dB." Thus, testing connectors requires mating them to reference connectors which must be high quality connectors themselves to not adversely affect the measured loss when mated to an unknown connector. This is an important point often not fully explained. In order to measure the loss of the connectors you must mate them to a similar, known good, connector. When a connector being tested is mated to several different connectors, it may have different losses, because those losses are dependent on the reference connector it is mated to. Connector and splice loss is caused by a number of factors. Loss is minimized when the two fiber cores are identical and perfectly aligned (more on the effects of misalignment), the connectors or splices are properly finished and no dirt is present. Only the light that is coupled into the receiving fiber's core will propagate, so all the rest of the light becomes the connector or splice loss. End gaps cause two problems, insertion loss and reflectance. The emerging cone of light from the connector will spill over the core of the receiving fiber and be lost. In addition, the air gap in the joint between the fibers causes a reflection when the light encounters the change n refractive index from the glass fiber to the air in the gap. This reflection (called fresnel reflection) amounts to about 5% in typical flat polished connectors, and means that no connector with an air gap will have less than about 0.3 dB loss. This reflection is called to as reflectance or optical return loss, which can be a problem in laser based systems. Connectors use a number of polishing techniques to create convex fiber ends that ensure physical contact of the fiber ends to minimize reflectance. On mechanical splices, it is possible to reduce back reflection by using non-perpendicular cleaves, which cause back reflections to be absorbed in the cladding of the fiber. The end of the fiber must be properly polished and clean to minimize loss. A rough surface will scatter light and dirt can scatter and absorb light. Since the optical fiber is so small, typical airborne dirt can be a major source of loss. Whenever connectors are not terminated, they should be covered with dust caps provided by the manufacturer to protect the end of the ferrule from dirt. One should never touch the end of the ferrule, since the oils on one's skin causes the fiber to attract dirt. Before connection and testing, it is advisable to clean connectors with lint-free wipes moistened with isopropyl alcohol or special dry fiber cleaners. Two sources of loss caused by mismatched fibers are directional; numerical aperture (NA) and core diameter differences inherent in the fibers being joined. Differences in these two will create connections that have different losses depending on the direction of light propagation. Light from a fiber with a larger NA will overfill the core of the receiving fiber be more sensitive to angularity and end gap, so transmission from a fiber of larger NA to one of smaller NA will be higher loss than the reverse direction. Likewise, light from a larger core fiber will have high loss coupled to a fiber of smaller diameter, while one can couple a small diameter fiber to a large diameter fiber with minimal loss, since it is much less sensitive to end gap or lateral offset. These fiber mismatches occur for two reasons, the occasional need to interconnect two dissimilar fibers and production variances in fibers of the same nominal dimensions. Production variances are only a few microns and contribute only small amounts of loss, but the loss caused by mismatches will be directional, causing larger losses when transmitting from larger to smaller core fibers. With two multimode fibers in common usage today (50/125 and 62.5/125) and two others which have been used occasionally in the past (100/140 and 85/125) and several types of singlemode fiber in use, it is possible to sometimes have to connect dissimilar fibers or use systems designed for one fiber size on another. If you connect a smaller fiber to a larger one, the coupling losses will be minimal, often only the fresnel loss (about 0.3 dB). But connecting larger fibers to smaller ones results in substantial losses, not only due to the smaller cores size, but also the smaller NA of most small core fibers. More on mismatched fiber losses. Typical connector losses are generally less than 0.3 dB for factory-polished singlemode or multimode connectors using adhesive/polish techniques. Few installers tackle singlemode field termination, generally fusion splicing factory-made pigtails onto the fibers, since SM polishing is not so easy in the field, especially in terms of reflectance. Multimode field terminations are common, since experienced installers can get results comparable to factory-terminations with adhesive/polish techniques. Field termination of prepolished/splice connectors using a precision cleaver (those made for fusion splicing) can produce consistent results around 0.5 dB, while the simple cleaver produces losses more often in the 0.75 dB range. Few industry standards put numbers on connector losses, but TIA 568 calls for connection losses of less than 0.75 dB, a high number but one which will allow use of prepolished/splice connectors. Reflectance or optical return loss (which has also been called "back reflection") of the connector is the amount of light that is reflected back up the fiber toward the source by light reflections off the interface of the polished end surface of the connector and air. It is called fresnel reflection and is caused by the light going through the change in index of refraction at the interface between the fiber (n=1.5) and air (n=1). Reflectance is primarily a problem with connectors but may also affect mechanical splices which contain an index matching gel to prevent reflectance. Reflectance one component of the connector's loss, representing about 0.3 dB loss for a non-contact or air-gap connector where the two fibers do not make contact. Minimizing the reflectance is necessary to get maximum performance out of high bit rate laser systems and especially AM modulated CATV systems. In multimode systems, reflections are less of a problem but can add to background noise in the fiber. Since this is more a problem with singlemode systems, manufacturers have concentrated on solving the problem for their singlemode components but multimode connectors benefit also since any reduction in reflectance also reduces loss. Several schemes have been used to reduce reflectance, mainly using a convex physical contact (PC) polish on the end of the connector ferrule, which reduces the fresnel reflection. The technique involves polishing the end surface of the fiber to a convex surface or even better at a slight angle (APC or angled physical contact) to prevent reflectance. See Connector Ferrule Shapes & Polishes below for more information on connector ferrule endface polish to reduce reflectance. See Measuring Reflectance to see the methods and issues of measuring reflectance. It is very important to inspect and clean all fiber optic connectors properly before testing, including the connectors on all reference test cables. The core of an optical fiber is quite small; so small that airborne dust is often as large as the core of singlemode fiber and even large compared to multimode fiber. A small dust particle on a connector ferrule can cause significant loss and reflectance when two connectors are mated or contaminate fiber optic transceivers. Dirt can sometimes even damage the fibers. Liquids like oils on your fingers can contaminate connectors and make cleaning difficult. Cleaning connectors has historically been done with pure isopropyl alcohol (99% pure) and lint-free wipes in a wet/dry method. Wet a wipe in a spot with alcohol and wipe the connector ferrule end across the wet spot then dry it on the dry wipe. However, today there are many fiber optic cleaning products available that work better and are easier to use. There are dry cleaning methods as well as wet/dry methods, cleaning fluids that are more effective than alcohol and more effective wipes. Every test tech should have a fiber optic cleaning kit and use it to clean all connectors using a inspect/clean/inspect process to insure the connectors are properly cleaned. Since fiber optic technology was introduced in the late 70s, numerous connector styles have been developed - probably over 100 designs. Each new design was meant to offer better performance (less light loss and reflectance) and easier, faster and/or more inexpensive termination. Of course, the marketplace eventually determines which connectors are successful. However several attempts to standardize connectors have been attempted. Some were unique to systems or networks. FDDI, the first fiber LAN, and ESCON, the IBM mainframe peripheral network, required unique connectors. TIA 568 originally called for SC connectors as a standard, but when users continued to use more STs than SCs and a whole new generation of smaller connectors were introduced, TIA-568B was changed to say that any connector standardized by a FOCIS standard document was acceptable. The four connectors shown at left show how fiber optic connectors have evolved. The bottom connector is a Deutsch 1000, the first commercially-available fiber optic connector. It was really a mechanical splice, where fibers were held inside the connector with a tiny screw-tightened chuck. The nose piece was spring-loaded, allowing exposing the fiber for cleaving and mating with a small plastic lens in a mating adapter. The mating adapter also had index-matching fluid to reduce loss but it was a dirt problem. The yellow connector is an AT&T Biconic. It was developed by Jack Cook at Bell Labs in the late 1970s. The conical ferrule was molded from glass-filled plastic. The first Biconics had ferrules molded around the fiber, until a die with a tiny 125 micron pin in the exact center was developed. When Biconics were adapted to singlemode fiber, the ferrules were ground on a special grinding machine to center the fiber. The LC connector was introduced in the late 1990s to miniaturize connectors for higher density in patch panels or equipment. It uses a smaller ceramic ferrule, 1.25 mm diameter. The LC is the connector of choice for telecom and high speed data (>1 Gb/s) networks. ST (an AT&T Trademark) is the one of the most popular connectors for multimode networks, like most buildings and campuses. It has a bayonet mount and a long cylindrical ferrule to hold the fiber. Most ferrules are ceramic, but some are metal or plastic. And because they are spring-loaded, you have to make sure they are seated properly. If you have high loss, reconnect them to see if it makes a difference. SC is a snap-in connector that is widely used in singlemode systems for it's excellent performance and multimode systems because it was the first connector chosen as the standard connector for TIA-568 (now any connector with a FOCIS standard is acceptable.) It's a snap-in connector that latches with a simple push-pull motion. It is also available in a duplex configuration. LC uses a 1.25 mm ferrule, half the size of the ST. Otherwise, it's a standard ceramic ferrule connector, easily terminated with any adhesive. Good performance, highly favored for singlemode and the connector of choice for multimode transceivers for gigabit speeds and above, including multimode Ethernet and Fibre Channel. MT-RJ is a duplex connector with both fibers in a single polymer ferrule. It uses pins for alignment and has male and female versions. Multimode only, field terminated only by prepolished/splice method. Basically obsolete. Opti-Jack is a neat, rugged duplex connector cleverly designed around two ST-type ferrules in a package the size of a RJ-45. It has male and female (plug and jack) versions. Volition is a simple, inexpensive duplex connector that uses no ferrule at all. It aligns fibers in a V-groove like a splice. Plug and jack versions, but one can field terminate jacks only. 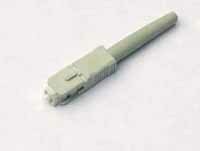 MPO is a 12 fiber connector for ribbon cable. It's main use is for preterminated cable assemblies. It has also been used in some multimode transceivers for high speed systems that use parallel optics - signals transmitted over multiple fibers. Here is an even more comprehensive guide to fiber optic connectors, including obsolete ones. The ST/SC/FC/FDDI/ESCON connectors have the same ferrule size - 2.5 mm or about 0.1 inch diameter- so they can be mixed and matched to each other using hybrid mating adapters. This makes it convenient to test, since you can have a set of multimode reference test cables with ST connectors and adapt to all these connectors. Likewise, the LC and MU use the same ferrule (1.25 mm diameter) so mating is possible. 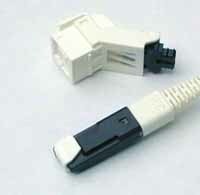 Two connectors have become the most popular worldwide, the SC and LC. The SC is a proven design and many systems have been built around it already. In premises cabling there are still many ST in service but new systems tend to use SCs. LCs are popular with the transceiver manufacturers since they allow these devices to be made much smaller and thus systems electronics to have much higher port density. Internationally there are systems using MU, E-200 and others but their popularity is lower than the SC and LC. The MPO multifiber connector is used in some high density prefabricated cabling systems since it can have multiple rows of 12 or 16 fibers in a single connector. Due to the difficulty of manufacture, it is not field terminated. It also has a major drawback, the difficulty of testing the cables with conventional test equipment. There are a number of specialty fiber optic connectors available such as this multifiber military connector, special underwater or aircraft connectors, plastic optical fiber (POF) connectors, etc. Most have been designed for very specific applications and require extremely rigorous qualification testing. Some like the Mil-C-38999, are copper wiring connectors adapted to hold fiber optic ferrules. 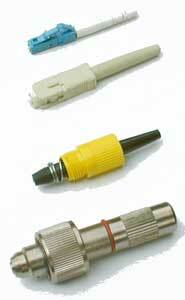 Many of these connectors require special cable types, termination procedures, cleaning, handling and test procedures. Refer to manufacturer's instructions whenever dealing with these types of connectors. Fiber optic connectors can have several different ferrule shapes or finishes, usually referred to as end finish or polish types. Early connectors, which did not have keyed ferrules and could rotate in mating adapters, always had an air gap between the connectors to prevent them rotating and grinding scratches into the ends of the fibers. The ends of the ferrules were polished on hard,flat surfaces. They are sometimes referred to as NC or "Non-Fiber Contact" styles. Beginning with the ST and FC which had keyed ferrules, the connectors were designed to contact tightly, what we now call physical contact (PC) connectors. These connectors were still polished flat on the end. Reducing the air gap reduced the loss and reflectance (very important to laser-based singlemode systems ), since light has a loss of about 5% (~0.25 dB) at each air gap and light is reflected back up the fiber. While air gap connectors usually had losses of 0.5 dB or more and a reflectance of -20 dB, PC connectors had typical losses of 0.3 dB and a reflectance of -30 to -40 dB. PC connectors required polishing on a flat surface with a soft rubber pad to allow the end to be polished convex. Soon thereafter, it was determined that polishing the connector ferrules to a convex end face would produce an even better connection. The convex ferrule guaranteed the fiber cores were in contact. Losses were under 0.3dB and reflectance -40 dB or better. The ultimate solution for singlemode systems extremely sensitive to reflections, like CATV or high bitrate telco links, was to angle the end of the ferrule 8 degrees to create what we call an APC or angled PC connector. Then any reflected light is at an angle that is absorbed in the cladding of the fiber, resulting in reflectance of >-60 dB. Whatever you do, always follow the manufacturer's termination instructions closely . 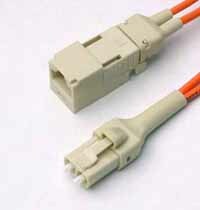 Multimode connectors are usually installed in the field on the cables after pulling, while singlemode connectors are usually installed by splicing a factory-made "pigtail" onto the fiber. The tolerances on singlemode terminations are much tighter than multimode and the polishing processes are more critical, so singlemode termination is better done in a factory environment using polishing machines (right). You can install singlemode connectors in the field for low speed data networks, but you may not be able to get losses lower than 1 dB and reflectance may be a problem! Connectors can be installed directly on most cable types, including jacketed tight buffer types like simplex, zipcord and breakout cables, where the where the aramid fiber strength members in the cable are crimped or glued to the connector body to create a strong connector. Connectors can be attached to the 900 micron buffered fibers in distribution cables, but the termination is not as rugged as those made to jacketed cables, so they should be placed in patch panels or boxes for protection. The 250 micron buffered fibers in loose tube cables cannot be easily terminated unless they have a reinforcement called a breakout kit or furcation kit installed, where each fiber is covered by a larger plastic tube. 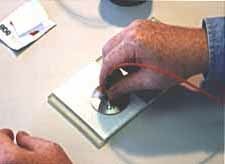 Generally loose tube and ribbon cables are terminated by splicing on a terminated pigtail. 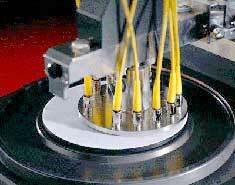 Singlemode Terminations: Singlemode fiber requires different connectors and polishing techniques that are best done in a factory environment. Consequently most SM fiber is field terminated by splicing on a factory-terminated pigtail or using prepolished/splice connectors. Singlemode termination requires special connectors with much tighter tolerances on the ferrule, especially the hole for the fiber. Polishing requires special diamond polishing film on a soft rubber pad and a polishing slurry to get low reflectance. But you can put SM connectors on in the field if you know what you are doing. Expect higher loss and high reflectance. Adhesive Terminations: Most connectors use epoxies or other adhesives to hold the fiber in the connector ferrule and polish the end of the fiber to a smooth finish. Follow termination procedures carefully, as they have been developed to produce the lowest loss and most reliable terminations. Use only the specified adhesives, as the fiber to ferrule bond is critical for low loss and long term reliability! We've seen people use hardware store epoxies, Crazy Glue, you name it! And they regretted doing it. Only adhesives approved by manufacturers or other distributors of connectors should be used. If the adhesive fails, not unusual when connector ferrules were made of metal, the fiber will "piston" - sticking out or pulling back into the ferrule - causing high loss and potential damage to a mated connector. The polishing process involves three steps which only takes a minute: "air polishing" to grind down the protruding fiber, polishing on a soft pad with the fiber held perpendicular to the polishing surface with a polishing puck and a quick final fine polish. Epoxy/Polish: Most connectors, including virtually all factory made terminations, are the simple "epoxy/polish" type where the fiber is glued into the connector with epoxy and the end polished with special polishing film. These provide the most reliable connection, lowest losses (less than 0.5 dB) and lowest costs, especially if you are doing a lot of connectors. The small bead of hardened epoxy that surrounds the fiber on the end of the ferrule even makes the cleaving and polishing processes much easier - practically foolproof. The epoxy can be allowed to set overnight or cured in an inexpensive oven. A "heat gun" should never be used to try to cure the epoxy faster as the uneven heat may not cure all the epoxy or may overheat some of it which will prevent it ever curing. Don't use "Hot Melt" ovens either, as they use a much higher temperature and will ruin the epoxy. "Hot Melt" Adhesive/Polish: This is a 3M trade name for a connector that already has the epoxy (actually a heat set glue) inside the connector. You insert the connector in a special oven. In a few minutes, the glue is melted, so you remove the connector, insert the stripped fiber, let it cool and it is ready to polish. Fast and easy, low loss, but not as cheap as the epoxy type, it has become the favorite of lots of contractors who install relatively small quantities of connectors. Remember you need a special Hot Melt oven, as it needs a much higher temperature than is used for curing epoxy. Anaerobic Adhesive/Polish: These connectors use a quick setting "anaerobic" adhesive to replace the epoxy or Hot Melt adhesive that cures faster than other types of adhesives. They work well if your technique is good, but some do not have the wide temperature range of epoxies. A lot of installers are using Loctite 648, with or without the accelerator solution (Loctite 7471 or 7649), that is neat and easy to use. More on processes used for adhesive/polish connectors. Prepolished/splice and splice-on connectors eliminate the need for field adhesives and polishing by terminating connectors to a stub fiber in a factory and attaching it to the fiber with a mechanical splice (prepolished/splice connectors) or a fusion splice (splice-on connectors, called SOCs). Terminating the fiber them becomes a splicing process instead of the more complicated polishing methods. The termination process involves cleaving the fiber and attaching the connector with a built-in mechanical splice or using a fusion splicing machine. It is faster than the adhesive/polish connectors when done by an experienced tech. These connectors require analysis of the economics of their use. Both methods require investment in special equipment. Prepolished/splice connectors generally require special termination kits for each manufacturer's connector due to the uniqueness of the connector and splice. Some kits provide an inexpensive cleaver which is difficult to use so it should be replaced with a precision cleaver as used with fusion splicers. Splice-on connectors require a fusion splicing machine, more expensive than the kits for prepolished splice connectors, and some of these connectors only work with specific manufacturer's splicing machines. The connectors themselves are more expensive than a typical connector used for adhesive/polish termination. The ones with mechanical splices are generally much more expensive than the fusion splice-on connectors. Another factor in cost is the yield. Fusion splice-on connectors will have lower loss and virtually 100% yield while mechanical prepolished/splice connectors will have average higher losses and lower yield. Read more about termination processes and view the actual processes involved in termination with "Virtual Hands-On" tutorials. See the FOA Guide Table of Contents for listings of termination types under Components. Don't overpolish. Contrary to common sense, too much polishing is just as bad as too little. The ceramic ferrule in most of today's connector is much harder than the glass fiber. Polish too much will cause undercutting of the fiber and you create a concave fiber surface not convex as it should be, increasing the loss. A few swipes is all it takes. Do You Have To Terminate In The Field? Not necessarily. Many manufacturers offer prefabricated fiber optic cabling systems for both premises and outside plant systems. In fact, the largest application for prefabricated systems is fiber to the home (FTTH) where it saves a tremendous amount of time in installation and cost. Using prefab systems requires knowing precisely where the cable will be run so cable lengths can be specified. Using CAD systems and design drawings, a complete fiber optic cabling system is designed to the customer's specifications and built in a factory using standard components. Early prefabricated systems (some are still available) simply terminated cables with standard connectors like STs or SCs and put them inside a plastic pulling boot with a pulling loop attached to the fiber strength members. The cable would be placed with the boot in place then removed to connect into patch panels. Today, it's more common to use backbone cables terminated in small multifiber MTP connectors that are pulled from room to room and connected to rack-mounted modules that have MTP connectors on the back and single fiber connectors on the front (see photo of Fiberware system.) Like everything else, there are tradeoffs. The factory-assembled connectors usually have lower loss than field terminations but the MTP connectors, even factory assembled, are not low loss, so the total loss may be more than field terminated systems. Costs also involve tradeoffs, as factory systems are more expensive for the components but installation time is much less. In new facilities, considering prefabricated systems is always a good idea, but all factors should be considered before making a decision. More on prefab cable systems. More on connectors and termination, including hands-on tutorials. Splicing is more common in outside plant (OSP) applications than premises cabling, where most cables are pulled in one piece and directly terminated. Splicing is only needed if the cable runs are too long for one straight pull or you need to mix a number of different types of cables (like bringing a 48 fiber cable in and splicing it to six 8 fiber cables.) And of course, we often use splices for OSP restoration, after the number one problem of outside plant cables, a dig-up and cut of a buried cable, usually referred to as "backhoe fade" for obvious reasons! Splices: fusion on the far left, other types of mechanical splices. 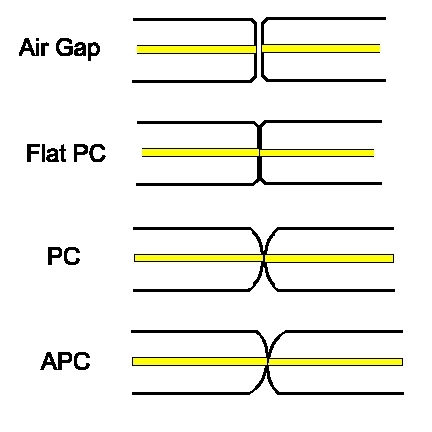 Splices are "permanent" connections between two fibers. There are two types of splices, fusion and mechanical, and the choice is usually based on cost or location. Most splicing is on long haul outside plant SM cables, not multimode LANs, so if you do outside plant SM jobs, you will want to learn how to fusion splice. If you do mostly premises cabling like MM LANs, you may never see a splice. Fusion splicing is most widely used as it provides for the lowest loss and least reflectance, as well as providing the strongest and most reliable joint. Virtually all singlemode splices are fusion. 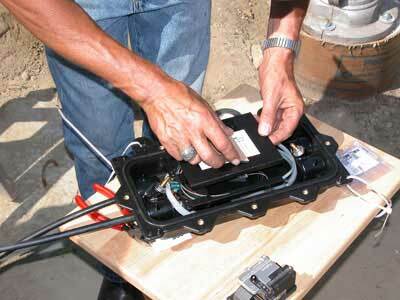 Mechanical splicing is used for temporary restoration and for most multimode splicing. Read more on splicing below. 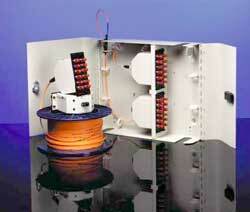 Fusion Splices are made by "welding" the two fibers together usually by an electric arc. To be safe, you should not do that in an enclosed space like a manhole or an explosive atmosphere, and the equipment is too bulky for most aerial applications, so fusion splicing is usually done above ground in a truck or trailer set up for the purpose. (photo above) Today's singlemode fusion splicers are automated and you have a hard time making a bad splice as long as you cleave the fiber properly. The biggest application is singlemode fibers in outside plant installations. Fusion splices are so good today that splice points may not be detectable in OTDR traces. 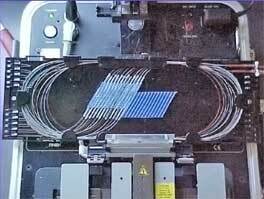 Some splicing machines can do one fiber at a time but Mass Fusion Splicers can do all 12 fibers in a ribbon at once. Fusion splicers cost $15,000 to $40,000, but the splices only cost a few dollars each. The fusion splicing process is basically the same for all automatic splicing machines. The first step is to strip, clean & cleave the fibers to be spliced. Strip the primary buffer coating to expose the proper length of bare fiber. 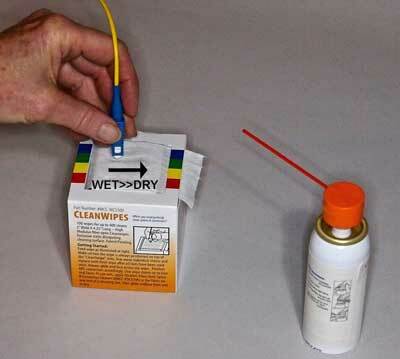 Clean the fiber with appropriate wipes. Cleave the fiber using the directions appropriate to the cleaver being used. Place each fiber into the guides in the fusion splicing machine and clamp it in place. First choose the proper program for the fiber types being spliced. The splicer will show the fibers being spliced on a video screen. Fiber ends will be inspected for proper cleaves and bad ones will be rejected. That fiber must be cleaved again. The fibers will be moved into position, prefused to remove any dirt on the fiber ends and preheat the fibers for splicing. The fibers will be aligned using the core alignment method used on that splicer. Then the fibers will be fused by an automatic arc cycle that heats them in an electric arc and feeds the fibers together at a controlled rate. 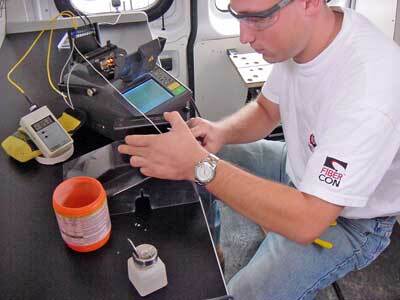 When fusion is completed, the splicing machine will inspect the splice and estimate the optical loss of the splice. It will tell the operator if a splice needs to be remade. The operator removes the fibers from the guides and attach a permanent splice protector by heat-shrinking or clamping clam shell protectors. Ribbon cables are fusion spliced one ribbon at a time, rather than one fiber at a time. Thus each ribbon is stripped, cleaved and spliced as a unit. Special tools are needed to strip the fiber ribbon, usually heating it first, then cleave all fibers at once. Many tools place the ribbon in a carrier that supports and aligns it through stripping, cleaving and splicing. 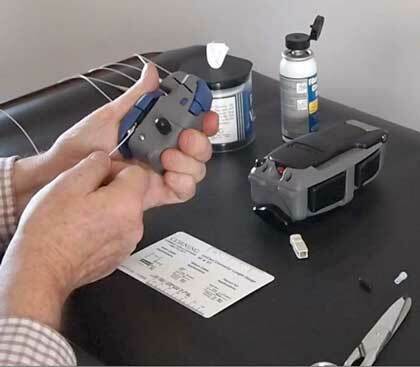 Consult both cable and splicer manufacturers to ensure you have the proper directions. Mechanical Splices are alignment components that hold the ends of two fibers together with some index matching gel or glue between them. There are a number of types of mechanical splices, like little glass tubes or V-shaped metal clamps. The tools to make mechanical splices are cheap, but the splices themselves are more expensive. Many mechanical splices are used for restoration, but they can work well with both singlemode and multimode fiber, with practice - and using a quality cleaver such as those used for fusion splicing. Splices require placement in a protective case. They are generally placed in a splice tray which is then placed inside a splice closure for OSP installations or a patch panel box for premises applications. At splice closures and at each end, cables with metallic shielding or strength members must be properly grounded and bonded. If cost is the issue, we've given you the clues to make a choice: fusion requires expensive equipment and but makes cheap splices, while mechanical splices require inexpensive equipment and expensive splice hardware. So if you make a lot of splices (like thousands in an big telco or CATV network) use fusion splices. If you need just a few, use mechanical splices. 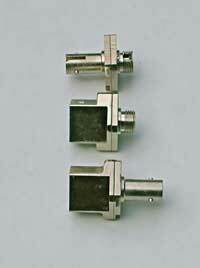 Fusion splices give very low back reflections and are preferred for singlemode high speed digital or CATV networks. However, they may not work well some multimode fibers, so mechanical splices may be preferred for MM, unless it is an underwater or aerial application, where the greater reliability of the fusion splice is preferred. Making consistently low loss splices depends on proper techniques and keeping equipment in good shape. Cleanliness is a big issue, of course. Fiber strippers should be kept clean and in good condition and be replaced when nicked or worn. Cleavers are most important, as the secret to good splices - either fusion or mechanical - is having good cleaves on both fibers. Keep cleavers clean and have the scribing blades aligned and replaced regularly. Fusion splicers should be properly maintained and fusing parameters set for the fibers being spliced. For mechanical splices, light pressure on the fiber to keep the ends together while crimping is important. Use a visual fault locator (VFL) to optimize the splice before crimping if possible.